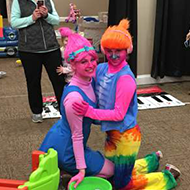 Trolls have moved into our neck of the woods for a special troll birthday party at Kids Kustom Parties in Palatine, IL. We offer three troll birthday party packages to fit your child’s imagination and your budget. DJ Suki and Princess Poppy will host and entertain your little ones when you opt for our gold package. Not only do our talented actors wear costumes, but they’re also trained performers who sing and dance. 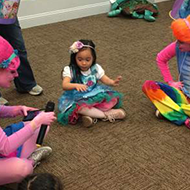 Your child and her friends will be enchanted when DJ Suki lays down a beat and Princess Poppy sings and dances. Plus, all the birthday party guests will get to wear princess costumes or capes and masks. If you prefer to have a home birthday party, our trolls can visit you. Learn more about kids party characters who can come to your venue. > 8x10 group photo for VIP . Trolls were a part of Scandinavian folklore. The first troll story emerged in 800 in Norway. She appeared in the forest and challenged a Viking poet to a contest. In the 19th century, Norwegian fairy tales, such as The 3 Billy Goats Gruff were popularized in the United States when they were translated into English. In 1959, a Danish woodworker created the troll dolls, one of the best-selling toys of all time.